For a little less than 100 years Calophyllum Inophyllum has been studied & used for its amazing skin rejuvenation and cell renewal abilities. 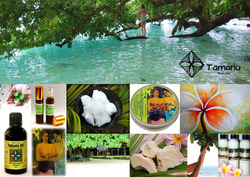 A wildharvested oil from the South Pacific used for acne, skin & hair dryness, wrinkles and anti-ageing purposes. 1- Soothing and protective effect on the skin (sunburn, inflammation, skin redness, insect bites). EVIC-CEBA laboratory study June 2000 - Ih268/01. 2- Regenerating effect on the epidermis cells, wound healing (burns, cuts, cracks, scars...). Microna laboratory Feb. 2003 - N°03/0607i. 3- Improves the appearance of aged scars (1 year or older). Australian Society of Cosmetic Chemists Annual Congress, Hamilton Island 2003 The role of natural ingredients in anti-ageing of the skin. 4- Anti acne, anti septic (Phytochemistry. 2004 Oct.;65(20):2789-95), anti inflammatory (ABICH oct.2005 - REL/244/05/FUNZ/ELB), anti viral (Bioorg Med Chem Lett. 1998 Dec. 15;8(24):3475-8) & (Med Res Rev. 2000 Sept.;20(5):323-49), antibiotic, anti-coagulative, fungal inhibitor (Yao Xue Xue Bao. 2004 Apr. ;39(4):305-8) and antibacterial effects (Microna laboratory oct.2002 - °02/4500i) & (Indian J Exp Biol. 1970 Jan;8(1):39-40). 5- Natural UV filter, inhibit 85 % of the DNA damage and oxidative stress induced by UV radiation at 1% concentration in ophthalmic preparations (Eur J Pharm. Sci 2007 Mar;30(3-4):203-10. Epub 2006 Nov 9). 6- Calophyllum Inophyllum oil, even at low concentration (1/10,000, v/v), exhibited significant UV absorption properties (maximum at 300nm) and was associated with an important sun protection factor (18-22) in ophthalmic preparations. (Eur J Pharm. Sci 2007 Mar;30(3-4):203-10. Epub 2006 Nov 9). 7- A naturally occurring anti HIV agent (Pharm. Biol., vol 37, n 1, pp71-76). 8- chemopreventive agents (anti-tumor-promoting agents). Cancer Lett. 2001 Aug. 10;169(1):15-9. 9- Moisturising, nourishing and repairing (epidermal cells) effect on the skin (dry and damaged skin, wrinkles, anti ageing...). Microna laboratory feb.2003 - N°03/0607i. Dermscan - April 2007 - study N°07D0458. 12- Hypo allergenic (non irritant, non sensitizing). Dermscan April 2007- study DN-730/07EO398.